Once upon a time in Puglia, the impoverished stiletto heel of Italy's boot, the mere sight of an egg was quite something. It was a hardscrabble life in those rural southern regions, a tough, hand-to-mouth existence where eggs, alongside salt, butter and meat, were hard-to-come-by luxuries. Instead, the enterprising locals made do with what they had, pulling together dishes from the simplest and cheapest of ingredients – things they could easily forage from the land or take from the waters of the region's long Adriatic coastline. In doing so they created la cucina povera – peasant or poor man's cooking. Things have improved since then – the glimpse of a Puglian uovo isn't quite so shocking – but it's a tradition that not only lives on, it's in the process of being rediscovered. Cucina povera, or la cucina rustica as it's also known, is essentially cooking with a few humble ingredients that are simple, local, seasonal and fresh – a modern foodie's Christmas wish list. Until recently Puglia (and especially its southern province of Salento) somehow managed to stay off the tourism radar – too far, too poor, too much not Tuscany – but it's becoming more and more popular with people drawn to its unspoiled coastline, handsomely historic cities, eccentric hilltop towns and, increasingly, its cucina povera cooking schools and restaurants. Cucina povera, or la cucina rustica as it's also known, is essentially cooking with a few humble ingredients. Best known for its olive trees – there were 50 million of them at last count – Puglia is an old countryside that has been ravaged by successive waves of invaders, each one leaving a little of themselves behind both in the architecture and the cuisine. 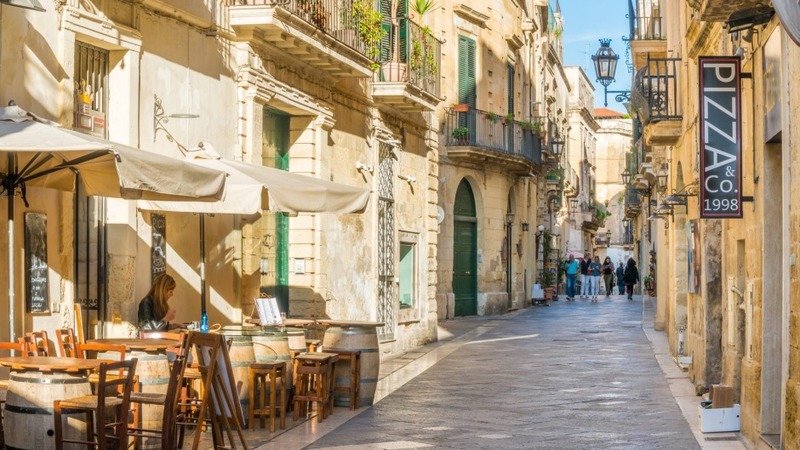 Here you'll find little cafes in secluded squares far from any madding crowds, restaurants tucked away in ancient citadels and great places to stay in the traditional masseria (fortified farmhouses) that dot the region. Gianna Greco is a chef who was born and raised in Lecce. Here she learned the cucina povera from her mother and grandmother and today runs the Cooking Experience School deep in the old city's back streets with help from her daughter, Maya. It is simply, she says, bustling around her kitchen in a pair of incongruous Blundstones, "great food with simple, yet high quality and available ingredients. That is to say, utilising both what is contained in the kitchen or pantry and what isn't too costly at the market". Of course, any cooking class at Greco's place ends up with a meal and a glass or two either in the high, vaulted ceiling dining room at the back or in the sunny courtyard beyond that, but there are plenty of other places to try the cucina povera and not so povera in Lecce. One place popular with locals and tourists alike is Corte dei Pandolfi, an unassuming restaurant just around the corner from the Piazza del Duomo. Here they serve up traditional Salentine dishes with a focus on fish. Check out the anchovies with spaghetti, marinated mullet and the simple ricotta and grilled veg. Or try La Cucina di Mamma Elvira, a modern osteria serving typical Puglian food such as burratina e ciliegino semi secco (burrata with semi-dried cherry tomatoes). Here's a thing; if you get the chance to eat burrata anywhere in Puglia, take it. Mastro, on one of the main pedestrianised streets in the old city centre and therefore great for watching la passeggiata, serves organic ingredients where possible and specialises in local wines and beers. In stunning Ostuni, the so-called white city (la citta bianca) an hour's drive north of Lecce, take time to pause at Pausa Cafe, at the bottom of a staircase just off the small main square, where they specialise in 'l'aperitivo Pugliese per eccellenza'. Go the lunchtime tapas-style plate if you can; it's a cornucopia of local meats, fresh anchovies, chunky octopus and various local cheeses, including that beautifully gooey Pugliese burrata. Wash it down with a crisp rosé and it's worth the trip for that alone. Of course if your tastes run to more up-market fare then the elegant, Michelin-starred Cielo restaurant in the five-star Relais La Sommita hotel might be more your style. Just close by are the funky Riccardo Caffe and the amazing Mela Bacata Lounge Bar and Risto' with its large green beanbags strewn down a steep and narrow staircase with sensational views across to the Adriatic. Perfect for a sunset cocktail. 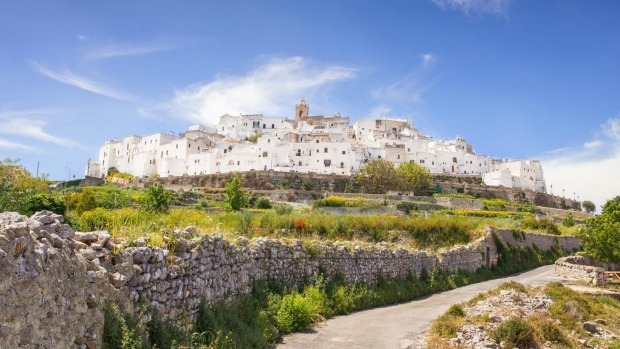 As with anywhere these days Puglia isn't short of B&Bs, Airbnbs and hotels of all shapes, sizes and stars, but for a real taste of the south there's nothing quite like staying in one of the traditional masseria. Initially simple farmhouses, persistent piratical pillaging through the ages saw them gradually converted into fortified strongholds behind which both owners and workers could retreat in relative safety. Today, after falling out of favour and into disrepair for many years, they are being refurbished and turned into boutique hotels. 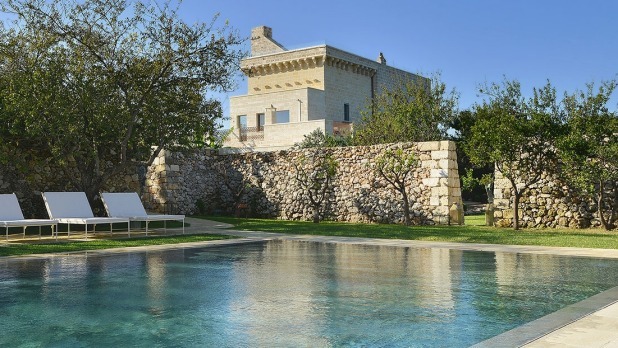 Just a 15-minute drive from Lecce is the magnificent 16th century Masseria Trapana. Once pretty much a ruin it has been stunningly restored by Australian hotelier Rob Potter-Sanders. From the outside, with its forbidding front door set in thick walls, it looks very much like the fortress it once was. Inside, though, Potter-Sanders has worked wonders. There is a large, sun-drenched central courtyard off which extend the tasteful lounge and dining room and 10 luxuriously appointed bedrooms with four-poster beds and enormous alfresco bathtubs. The all-local cuisine dinner at the masseria is excellent, and best taken candle-lit on the outside terrace by the citrus orchard. The hand-to-mouth existence of the past is still real.